Are you overdue for your annual physical with your internist or family physician? You are a busy caregiver so the answer is most likely yes. The time you take for yourself is precious and when you are at the doctor’s office it’s important to come prepared and know what to expect. Before your appointment, write down your list of concerns so that you won’t forget something important that you wanted to discuss. Review your list at the beginning of the visit so that your doctor can prioritize the time allotted for this visit. In other words, don’t wait until the end of the visit to bring up your concerns over your recent chest pains. Bring a list of all the doctors you see and include their name, specialty, and phone number. Bring a pen and extra paper to take notes during the visit. Even the most attentive patients with perfect hearing remember less than 50% of the recommendations made by their physician. In my practice, I also ask my patients to bring their prescriptions, over the counter, and supplement bottles to their annual appointments. Why? Because it’s the clearest way for your doctor to understand what you are taking. Many patients unknowingly make errors when they copy the medicine labels. Lastly, know your medical history even if it means you have to do your research before the visit. 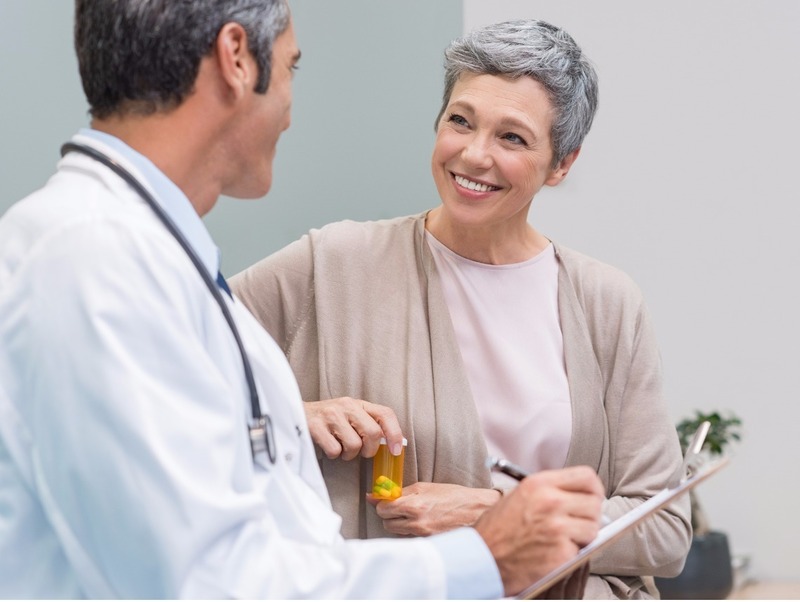 Your physician will ask you about your current and past medical and surgical histories, your family’s medical history, your drug allergies, and your lifestyle habits. Expect your physician to review wellness and prevention topics including screening for cancer, osteoporosis, and vascular disease. Your doctor may make recommendations about vaccinations, exercise, diet, caffeine, alcohol, and water intake. Most seniors need four vaccines. Seniors are eligible for a yearly flu vaccine, shingles vaccine at age 60, pneumonia vaccine at age 65, and tetanus with pertussis booster. Screening for prostate cancer is recommended yearly until age 75 and beyond that age, there is currently not enough evidence to determine whether screening improves health outcomes for prostate cancer. Yearly mammography is recommended for women ages 50 to 74 and beyond that age, there is not enough evidence to determine whether screening improves health outcomes. In reality, many of my patients choose yearly mammograms into their eighties. Colonoscopies are recommended for patients turning 50 and every ten years thereafter if there wasn’t any polyp detected. Pap smears are recommended for women who still have a cervix (no hysterectomy history) and who remain sexually active. This is recommended for women ages 65 and older. It’s done every two years and is a simple scan measuring bone density at the lumbar spine and hip sites. Men between the ages of 65 and 75 who were or currently are smokers should have a one-time ultrasound to evaluate for an abdominal aortic aneurysm. An aneurysm is a weakness in the wall of the artery that causes that area to balloon out, much like a weak spot in a garden hose can create a bubble. If an aneurysm expands too large, there is a risk of the aorta rupturing. Next, an EKG is recommended for anyone with cardiovascular risk factors such as tobacco use, hypertension, and diabetes. Blood pressure will be taken during your visit to screen for hypertension. Hypertension is defined as a systolic (top number) blood pressure of 140 and higher or diastolic (bottom number) blood pressure of 90 and higher, and must be confirmed by two or more readings separated over two to four weeks. Fasting lab work including lipids (cholesterol) and glucose (blood sugar) will be included in your annual blood tests. Wear loose fitting clothing and expect your physician to examine your head and neck, lungs, heart, abdomen, circulation/pulses, and reflexes/ coordination. Finally, be proud of yourself for taking charge of your health and making this time to get on the path to wellness. Sometimes the hardest part is just scheduling the appointment.